After Syrian troops began shelling civilian targets in the city of Hama, brave activists used smuggled phones and sympathetic allies abroad to upload grainy, graphic warfare footage onto YouTube. On Sunday Syrian tanks assaulted Hama and shelled civilian targets; at least 70 are confirmed dead and hundreds more seriously injured. Observers are calling it the “Ramadan Massacre” since it occurred on the eve of the Muslim holiday. And in keeping with the recent events of the Arab Spring and overall unrest in the Mideast, one of the Assad regime’s greatest headaches is that activists are uploading videos and still images of the fighting and its aftermath to the Internet. Syrian anti-government activists are actively promoting the English-language #ramadanmassacre hashtag for Twitter searches; this method remains the easiest method of finding out info on what’s happening in Hama. YouTube has been flooded by dozens of videos taken by Hama protesters; most of them show scenes of extreme violence and are not safe for work viewing. 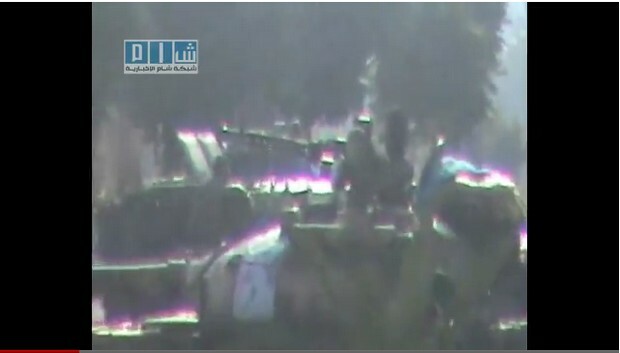 The graphic videos, which were uploaded yesterday from accounts associated with Syrian dissident groups such as Ugarit News and the Shaam News Network, clearly depict casualties and army shelling of urban targets. One especially disturbing video (NSFW) shows corpses being taken to a makeshift morgue inside Hama. However, the volatile situation in Syria means that activists’ methods to get documentation off the streets and onto social media are rapidly changing. Unconfirmed reports claim pen phones and small camera phones are being smuggled into Syria by anti-government expatriates and both the Saudi Arabian and American governments. Sympathizers and friends in Turkish border towns have also helped, smuggling Turkish SIM cards across the border to Syrians hiding in makeshift refugee camps in the woods. Tapping into Turkish cell phone providers has allowed fleeing Syrians to send updates and messages without being tracked by authorities. Many there are planning their path to Turkey. To bridge the communications gap, the US and Saudi Arabia have in the last two weeks smuggled thousands of satellite phones into Syria and put them in the hands of opposition leaders […] The new phones will also overcome the latest Syrian steps, also on the advice of their Iranian advisers, to slow down the speed of the Internet to impede the transmission of images–most of all live video–of brutal attacks by Syrian security and military forces on protesters. US and Saudi intelligence services are picking up the tab for the satellite phones and have given the providers a free hand to place no limits on their use. While DebkaFile’s report is as unverified as they get, the site has had a decent record in predicting Middle East developments. Formal Syrian dissident organizations are also playing a crucial part in getting information out. The London-based Syria Observatory Human Rights serves as an impromptu news source for the Syrian uprising, while the Local Coordination Committees of Syria has played a key part in publicizing and disseminating smuggled atrocity footage to the Syrian expatriate community. Fast Company has reported before on the Syrian government’s attempts to spy on Facebook users, the use of social media to organize protests and to disseminate atrocity videos, as well as how activists are using pen cameras and other hard-to-detect methods to secretly tape video. For more stories like this, follow @fastcompany on Twitter. Email Neal Ungerleider, the author of this article, here or find him on Twitter.